Coherent optical correlators, exploiting the Fourier transforming properties of lens and the capability to impart a phase modulation on a wavefront with an appropriate spatial light modulator (SLM), hold the promise of real-time implementation of two-dimensional correlation of realistic pattern recognition problems. However, their practical use has been delayed in many applications by the lack of availability of suitable SLM devices with the required speed and dynamic range. It is now possible to compute a two-dimensional Fourier transform at video-rates with various digital signal processing chip sets. This allows a hybrid correlator to be developed in which the input scene is digitally Fourier transformed at video-rate and multiple templates are searched during the next video frame interval by optical Fourier transformation at a speed at least two orders of magnitude faster than 'possible with digital methods. In this way, the input SLM is avoided and a precise spectrum is available for subsequent matching with stored templates. The speed advantage over all digital processing allows unconstrained pattern recognition problems to be tackled that require many template searches to match the input with a reference function. The hybrid correlator configuration is described, including a discussion of the digital implementation the video-rate FFT, the SLM device used as the digital/optical interface and design of the optical sub-system consisting of miniature collimating and Fourier transform lens systems. 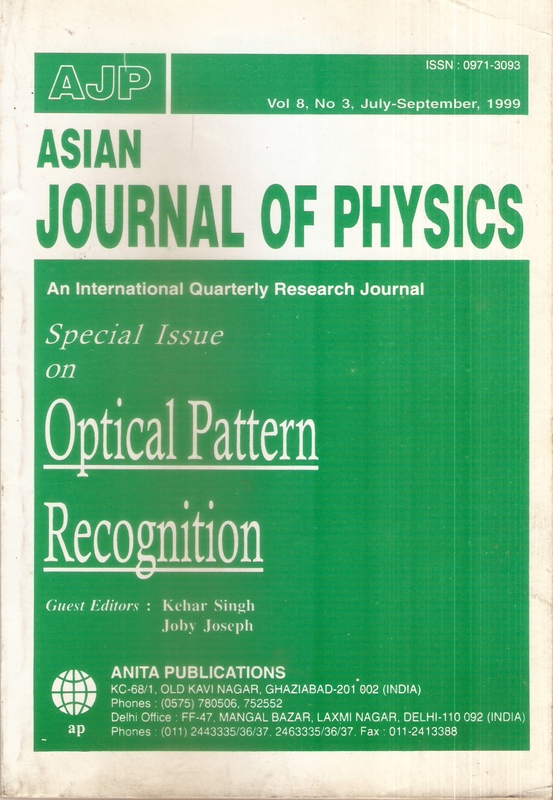 Optical pattern recognition is significantly improved by exploiting the attributes of both optics and electronics, in architectures containing combinations of optical systems and electronic processors. Essential interfaces for such hybrid systems are spatial light modulators and opto-electronic recording devices. These devices suffer from technological limitations that must be alleviated by suitably designed optical architectures and efficient processing algorithms. This paper reviews the development in the field and describes a new approach involving fuzzy projection algorithms to handle the imperfections of real systems. We propose an easy method for implementing holographic Haar wavelet (HW) filters in VanderLugt optical correlation using a liquid crystal display (LCD) as a binary phase modulator. The zero parts of the HWs are made by displaying grating or grid patterns on the LCD. To perform multiple HW transforms of an input pattern, three waves diffracted by a grid pattern of the electrodes in the LCD are utilized. It is shown that the optical HW transforms are useful for extracting features of input patterns. 1. Erbach S P, Gregory A D, Yang S, Appl Opt,35(1996)3117. 2. Tripathi R, Singh K, Opt Eng, 37(1998)532. 3. Kozaitis P S,Getbehead A M, Opt Eng,37(1998)1325. 4. Burns J T, Fielding H K, Rogers K S, Pinski D S, Ruck W D, Opt Eng,31(1992)1852. 5. Yang X, Szu HH, Sheng Y, Caulfield J H, Opt Eng,31(1992)1846. We discuss an algorithm for fractional encoding of amplitude by the binary phase, with the phase step width linearly depending on the amplitude value in the coding cell. A threshold amplitude level serves as the coding parameter: the amplitude is coded by the phase above this level and replaced by a constant value below it. The method is applied to designing spatial Fourier-filters matched to 2D images. Is the two beam coupling correlator realizable ? In this paper we perform extensive computer simulations and theoretical modeling to predict the performance of the two-beam coupling joint transform correlator. This was done in order to find the best operational conditions in which it is possible to realize a two-beam coupling correlator with high speed and resolution as well as optimal operation in terms of noise, peak intensity and efficiency. Our analysis predicts that an optimal trade-off performance is achieved for relatively thin holographic material operating with negative gain. The performance of real-time saturating photorefractive correlators, the two-beam coupling joint-transform correlator and the incoherent-erasure joint transform correlator with scenes of varying mean and variance, is investigated. Analysis shows that there is an inverse relationship between noise variance and saturation severity for which optimal correlation performance is achieved; scene mean level does not appear to affect the optimal correlation settings. The optimal correlation metrics are compared to those of the matched and the phase-only filter. Performances of three kinds of nonlinear joint transform correlators, a binary subtracted joint transform correlator, modified fringe adjusted joint transform correlator, and a joint transform correlator that uses a holographic interferometer and a photorefractive crystal, have been investigated in computer simulations by use of their algorithms to calculate correlation signals and various input scenes with a halftone target image and other images. It is shown that the correlator using a holographic interferometer and a photorefractive crystal is superior similar to the binary subtracted joint transform correlator. In this article we review the recently developed project of the three-dimensional optical correlator. Two versions of the three-dimensional joint transform correlator are described. The first correlator is equipped with a conventional reference object, i.e. a duplicate of the object that the system is intended to recognize. The second correlator has a synthetic reference function, which gives the system a property of invariance to some object's geometrical distortions. Nonlinear morphological correlation is new to optical pattern recognition. This paper reviews morphological correlation technique by comparing it with linear correlation technique from the perspectives of definition, performance and implementation. A drawback of morphological correlation is, it requires considerable amount of computational effort to obtain the result. We discuss three schemes to increase the system processing speed. In particular, a simplified morphological correlation scheme based on adaptive threshold decomposition is proposed. Computer simulation results are given in support of the claim. We introduce a correlation based method of morphology that transforms a gray level, rotated target image into a predefined pattern of binary spots. The location of the spot pattern indicates the location of a target and the orientation indicates the rotation of the target. This method is an enhancement of existing distortion-invariant correlation filter design. A general use of this method would be that of reducing complicated images into a small set of spots to be post processed by feature based algorithms. The mathematical characteristics are discussed and examples of their usage are demonstrated numerically. Elements of a theory of multi component target location are outlined and used to substantiate the design of multi component image correlators for reliable target location in clutter background. A special emphasis is made on the design of multichannel correlators suitable for optical implementation. We present a rotation-invariant and space-variant joint transform correlator (JTC). A JTC is made space-variant by modulating the reference and target functions with a random phase function. The variance of the random phase function determines the degree of space-variance. The rotation invariance is introduced by using the circular harmonic decomposition of the reference. The discrimination ability of the correlator is improved by processing of the joint image using an edge detection operation and phase encoding of the joint image. Computer simulation in support of the proposed ideas are presented.